‘Everyone is hooked on something,’ says the back cover blurb of Annie Hauxwell’s debut novel In Her Blood. I quickly became hooked on this novel. ‘Catherine Berlin, an investigator with a financial regulator, finds the almost-headless body of her informant in a shallow reach of the Thames. 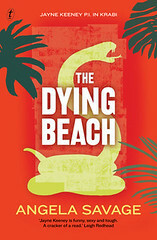 The death is linked to Berlin’s investigation of a local loan shark, and her unorthodox methods are blamed for the death. It looks as though she’ll pay only with her job, but then on a routine trip to her GP, who prescribes heroin to long-term addicts, she stumbles across a second body and is implicated in that murder, too. 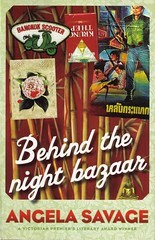 Catherine Berlin is the star of this book. In Berlin, Hauxwell pulls off the almost unthinkable, creating a sympathetic though unsentimental character who is by her own admission a career junkie. Her transition from recreational user to career junkie had been seamless and unremarkable. It wasn’t until her usual connection failed and she was seized with blind panic, that she realised a relationship she had regarded as casual was now serious. Berlin is a high functioning addict, holding down a job and a flat, seeking justice for her dead informant. But Hauxwell never allows the reader to forget the predominance of heroin in Berlin’s life. The novel is divided into sections called ‘The First Day’, ‘The Second Day’, etc, based on the number of ampoules of pharmaceutical-grade heroin Berlin has in her possession before her supply runs out. And we get to see how her decisions are shaped by her addiction, and the sometimes shocking way she prioritises access to the drug above all else. I had my biases about illegal drugs and drug users challenged years some ago when I worked in HIV/AIDS prevention. While some readers may struggle with Berlin’s character, to me she’s entirely credible: I found anti-drugs crusader Daryl Bonnington harder to believe. Still, there’s a lot to like in this book. The London setting is bleak, corrupt and unfriendly – commensurate with my limited experience of the place – a city in decay due to the global economic downturn. In this context, loan sharks prosper and Hauxwell effectively provides readers with instructions on how to set up a successful loan shark business – assuming they have the stomach for it – through the character of Archie Doyle aka ‘Oily Doyley’, the subject of Berlin’s investigation. The writing is sharp and suspenseful, the plot engaging, the characters enthralling. I’m hooked on Annie Hauxwell and hanging out for my next fix. 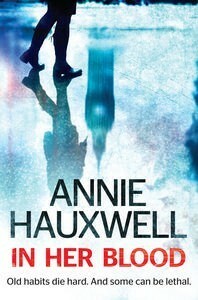 In Her Blood by Annie Hauxwell is published by Penguin. 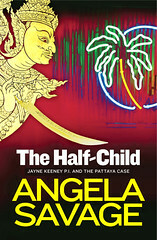 Listen to my review on Radio National Books & Arts Daily here. The Australian Government is inviting feedback on the Strategies for reducing reliance on high-cost, short-term, small amount lending Discussion Paper. 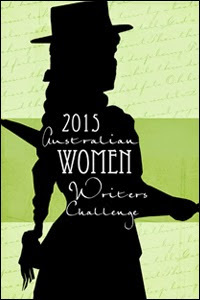 Submissions close Monday 4 June 2012. More information is at the Treasury website. This entry was posted in Reviews & Interviews and tagged Annie Hauxwell, book review, books, crime fiction, heroin, In Her Blood, loan sharks, payday loans discussion paper. Bookmark the permalink.